Finally,the day the kids had been waiting for had arrived. After 2 weeks of touring London and Barcelona, we were about to embark on the last leg of our European trip- a 5 day/ 4 night cruise to the Balearic Islands , departing from Barcelona with stops in Palma de Mallorca and Ibiza. Our family had previously cruised on the Magic, but this was before the “re-imagination” of the ship and we were all looking forward to seeing the new changes onboard. While the check-in and boarding process was not as well organized as other cruises we have been on, the long lines and tedious wait were quickly forgotten as the arrival of “The Flores Family” was announced. We were impressed as we walked into the spacious atrium. The blue and gold interior has a touch of Art Deco flair very much in line with the “classic” look of the Magic’s exterior. To me, the overall appearance was more subdued, yet cleaner and more opulent than the previous look. Our early boarding meant our cabin and luggage wouldn’t be ready for a couple of hours, so we headed straight to lunch. Carioca’s, a re-imagined restaurant concept, has a festive South American feel with bright hanging lanterns and the use of warm colors. My kids were so happy to finally see some familiar looking foods and they happily ate 2 huge plates of food apiece before making the requisite chocolate sundaes at the ice-cream bar. While the kids ate dessert, I ran by guest services to pick up tickets for the Anna and Elsa meet and greet the next day. After lunch, the kids changed into the swimsuits we had packed in our day bag and we headed to Deck 9. There are 3 exciting water attractions on this deck: the AquaLab is an area with a small pool, water features (like overflowing paint buckets) and a corkscrew slide called the Twist’n’Spout. Goofy’s Pool is the main family pool and looks onto the outdoor movie screen. Finally, the AquaDunk is an exhilarating 3-story water slide that actually extends over the edge of the ship before your final splash landing. My daughter was about 2” too short to try the AquaDunk so she hung out in the AquaLab; meanwhile, my 10 year old took advantage of the almost non-existent line to go down the AquaDunk 4 times. After a couple of hours at the pool, we made a quick stop to enroll our kids in the kid’s program and then we made our way to our cabin. Our 214 sq. foot Deluxe Oceanview Stateroom on Deck 5 looked very fresh with crisp white bedding and a new modern sofa. The room manages to incorporate an amazing amount of storage space, such as being able to store luggage under the elevated bed. Another innovative feature of Disney staterooms is that most feature a split bathroom- a tub/shower and sink behind one door and a toilet and sink behind another door. This bathroom set-up means is much easier for multiple people to get ready at the same time. We relaxed in our cabin while waiting to be called for the mandatory evacuation drill, then returned to our cabin for a little more R & R before dinner. Our dinner was in Lumiere’s, an elegant dining space inspired by “Beauty and the Beast” with a French-inspired menu. We were pleasantly surprised that Disney had matched us with a lovely couple from Boston who had kids exactly the same age as ours for our tablemates and we had lots of fun talking about what each family had done that day. Our serving team was fantastic- after the first night they had the kid’s drinks waiting at the table each night- and the food ranged from very good to excellent with the exception of fish dishes, which were slightly overcooked. We ended our first day with a performance of Villains Tonight, one of the live shows. Even though we had seen the show before, it was as funny as we remembered. Our first port stop was in Palma de Mallorca, the largest city and capital of the Balearic Islands. After breakfast, we took one of the free shuttles that Disney provided from the cruise pier to the Old City- the historical city center of Palma which is filled with narrow streets, beautiful buildings with intricate ironwork, and a bustling outdoor cafe scene. It is also home to the majestic La Seu Cathedral which was built between 1229-1346 and serves as a landmark and orientation spot for visitors. A bike and pedestrian path parallels the ocean and a 30 minute walk from the Old City will take you to an unnamed urban beach where we rented an umbrella and loungers. The water was quite calm and the kids enjoyed building sand castles and splashing in the waves. A few hours later, we decided to walk back to the Old City where we caught a shuttle back to the ship. After lunch, we spent time on Deck 9 enjoying the pool and the incredibly picturesque hillside views of Palma de Mallorca. That afternoon, I had a special treat lined up for my daughter- the meet and greet with Anna and Elsa. Most of the character meet and greets are in public areas of the ship on a first come first serve basis, but this meet and greet was set up in Lumiere’s and had a special Frozen backdrop. The look on my daughter’s face when she realized who we were there to see was priceless! For dinner, we sent our kids to the Oceaneer’s Lab (one of the kid’s clubs) as we had reservations at Palo’s, the adult only, upcharge restaurant. The floor-to-ceiling windows on Deck 10 assure that the ocean views from every seat are impressive and the venetian glass and wood paneling in the restaurant compliment it’s Northern Italian theme. The leisurely meal starts with a selection of fresh breads and a visit from the antipasti cart. Next there is a selection of soups, salads and pastas. We choose fish and lamb for our entrees and they were perfectly cooked and very flavorful. We ended our meal with Palo’s famous chocolate soufflé, which is served with both a chocolate and vanilla sauce. The chocolate aroma of the soufflé beckons you to break the sugar coated crust and once you have added the sauces you have a rich, moist soufflé which I can guarantee you won’t be able to stop eating! Our second port stop was in Ibiza Town on the island of Ibiza. The color of the water around Ibiza is simply stunning with shades ranging from a light sky blue, to turquoise, to an amazing azure color. Disney again provided a free shuttle to the center of town where we caught a cab and asked the driver to take us to the “nicest nearby beach”. After a 20 minute cab ride our driver pointed out a parking lot and instructed us to take the walkway down to the beach. A few steps later and we were on a gorgeous white powder beach. Cala des Salines, apart from having fine sand and incredibly clear water, was the perfect beach for families as it had a very gradually sloping descent. Our kids could be 20-30 feet out and still be in waist deep water. After about 4 hours of swimming and sunbathing in paradise we headed back to the ship so we could rest up for “Pirate Night”. Pirate Night is a beloved tradition on Disney cruises. Our dinner at Carioca’s had a special pirate-themed menu for the evening. Most cruisers dress up in varying degrees and you will see many people in elaborate pirate costumes. Since we had to pack for a 3 week vacation, we went with pirate t-shirts for the kids and scarves for the adults (although not to worry, the onboard store seems to transform overnight into a pirate store should you forget your gear!). We had another great dinner with our tablemates—it turns out they had also asked a cabbie for a beach recommendation and had ended up at a beach about 30 minutes away on the opposite side of the island. It sounded just as nice as Cala des Salines and made us wish we had a few more days to play in Ibiza. After dinner we saw another live show, then we went up to Deck 9 for the Pirate Party. The party involves lots of dancing and there is a loose story-line based on the devious Captain Hook with Mickey saving the day. Afterwards, there is a late night buffet where you can feast like a pirate—think giant turkey legs and decadent desserts! Our last full day on the cruise was a day at sea. We spend some time at the pools, we saw a 3D showing of Guardians of the Galaxy and the kids spent some time in the Oceaneer’s Lab. Our final dinner was at Animator’s Palate, a restaurant that starts out with black and white walls and gradually adds color throughout dinner until the end when Sorcerer Mickey appears and the whole restaurant in brilliantly colored in scenes from Disney movies. The next morning, disembarkation was quick and easy. The kids couldn’t believe that our time on the ship was over so quickly and we had to agree. There were so many places and activities that we just didn’t get around to: the nightclubs and lounges, cooking demonstrations, movies on the outdoor screen, trivia, arts and craft… the list goes on and on. 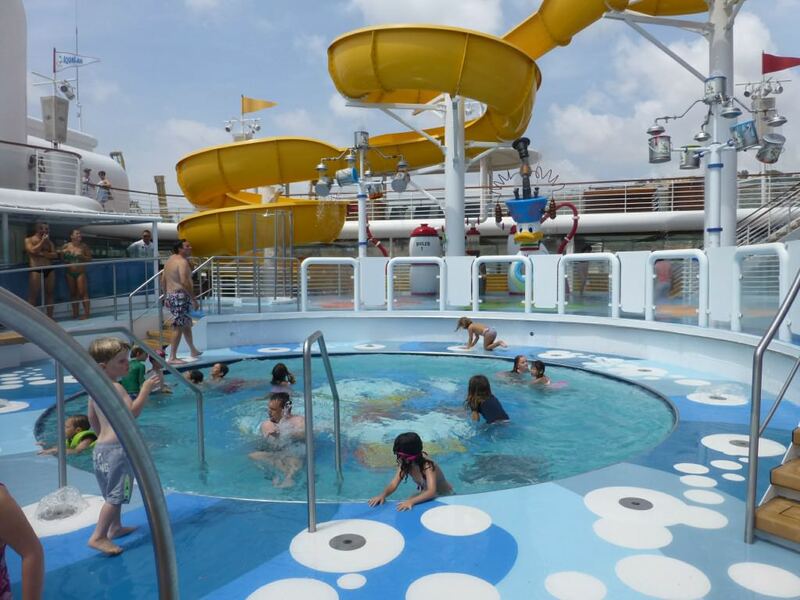 Travel Truths: This cruise was geared towards Spanish families. Probably 70% of passengers were Spanish and all announcements were made in English followed by Spanish, many of the movies were shown in Spanish, and there was an emphasis on Mediterranean dishes in the buffets. There were expanded smoking areas on Deck 9 and I saw lots of people smoking outside even in the smoke-free areas. While none of this detracted from our experience, it might not be the experience others expecting. Travel Tips: Consider participating in a Fish Extender (FE) for an even more memorable cruising experience for your kids.